The Zebra DS4308 area imager gives users an extra boost of speed. Thanks to PRZM intelligent imaging technology it ensures for excellent scanning speeds at the POS, in event areas and in light industry. Each model does the work for two: the standard version also scans from greater distances (up to 71.1 cm for standard UPC barcodes); the high density variant captures small barcodes, as well as normal sized ones (up to 41.9 cm for standard UPC barcodes). Scan 1D and 2D barcodes omni-directionally with the DS4308, plus capture images and signatures. It does not matter whether the codes are printed on labels, or appear digitally on smartphones/displays. The megapixel sensor ensures for high image quality at all times. The bright aiming dot simplifies targeting from greater distances. Thanks to its robust yet lightweight housing the DS4308 withstands accidental drops from heights of 1.8 m. This secures your investment for the long-term and minimizes downtimes. 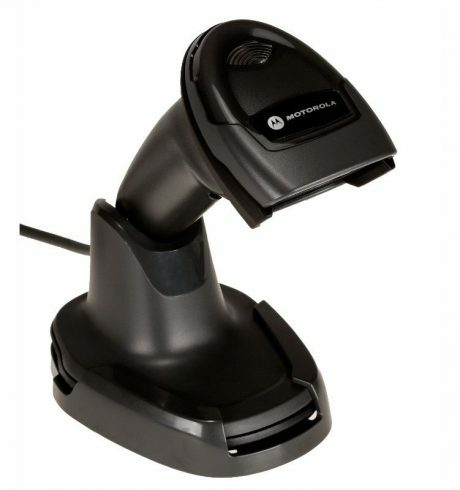 For applications requiring users to use both their hands there is an optionally available stand, with which the scanner automatically recognizes the barcodes.